There was a flurry of news coverage of the Khirbet Qeiyafa inscription yesterday, even though only a few words of that inscription have been translated (or, at least, announced). Here are a few highlights. CBS News has a 45-second video showing a man opening and handling the inscribed potsherd (ostracon). A few letters are visible. You can watch a 5-minute interview with the excavator, Yosi Garfinkel (in Hebrew) (via Yitzhak Sapir). A few photos were released, but they appear to be deliberately impossible to read, as the excavators naturally want to translate the inscription before someone on the internet does. It also has been suggested that high-tech photos may be necessary before the excavators are able to read the inscription in its entirety. Here are a few photos: ostracon 1, ostracon 2, aerial view of the site and the gatehouse. There is some debate on the ANE-2 list about whether this is a (Proto-)Canaanite inscription or a Hebrew inscription. A member of the excavation team has posted some of his thoughts on Jim West’s blog. And if you prefer your inscriptions on a coffee mug, Eisenbrauns just announced the 2008 Gezer Calendar mug. There are a couple of other stories that I don’t have time to comment on now, but you can read about Eilat Mazar’s discovery of the tsinnor (water shaft) that David used to conquer Jerusalem and about an inscribed stone seal found in Jerusalem. Don’t believe everything you read. The New York Times has an article in tomorrow’s print edition about Khirbet Qeiyafa (with thanks to Joe Lauer for pointing it out). The article appears to me to be a teaser, released on the same day of the excavator’s lecture in Jerusalem, which likely will include some new revelations. The article quotes a number of archaeologists, but most of the information is already known to those who have followed the excavation here or elsewhere. I’m going to comment on some portions of the article, but you’ll do best the read the article in its entirety first, and then read my comments. Five lines on pottery uncovered here appear to be the oldest Hebrew text ever found and are likely to have a major impact on knowledge about the history of literacy and alphabet development. This is a dramatic statement, but the rest of the article ignores the inscription. The “competition” for the earliest Hebrew text would be the Izbet Sartah inscription (11th century), the Gezer Calendar (10th century), and the Tel Zayit Inscription (10th century). Interestingly, all of these inscriptions are from the same general vicinity (the western foothills, aka Shephelah). A great power [like that described of David and Solomon], they note, would have left traces of cities and activity, and been mentioned by those around it. Yet in this area nothing like that has turned up — at least until now. Hold on here. Gezer is only a few miles up the road, and the excavations there were pretty decisive that it was a well-fortified city in the time of Solomon. This is an example of trying to make the site more important by denigrating the significance of others. Another reason this site holds such promise is that it was in use for only a short period, perhaps 20 years, and then destroyed — Mr. Garfinkel speculates in a battle with the Philistines — and abandoned for centuries, sealing the finds in Pompeii-like uniformity. This is very important. The problem with other sites is that they may be used for a long period of time, making it difficult to distinguish exactly what was going on at an earlier point it is history. For that reason, archaeologists love destructions. Even better is a single period site with a relatively short-lived occupation. These are some numbers that I had not seen before. It does seem strange that a fortress that took 10 years to build would only be in use for 20 years. Why was it not rebuilt? Was it because it was captured by the Philistines? Or was it because David’s kingdom was strong enough (and its border now further away) that this fortress was no longer necessary? Mazar certainly asks the key questions. It’s important to remember that many of these things are interpretive, which means that an archaeologist can interpret the finds one way and another archaeologist can come to a different (even opposite) conclusion. If only the stones could speak. The Philistines had a huge city, Gath, some seven miles away, but pottery found there looks distinct from what Mr. Garfinkel has found here. This suggests that Qeiyafa was an Israelite fort. That’s a real question because the Shephelah at this time was contested by the Philistines and Israelites. What Gitin is saying is that a fortress like this doesn’t come out of nowhere. There must be some sort of strong organizing force (government) that financed and directed it. This compound wasn’t built by three bored Israelites one Sunday afternoon. Whoops! Look at how quickly Finkelstein re-dated the whole enterprise by approximately a century. Earlier in the article the fortress is dated to 1050-970 B.C. Finkelstein makes it late 10th-century with a wave of his hand. This is not accidental, as his recent publications are built upon the theory that the biblical history was written very late and is entirely unreliable. Any discovery which suggests a strong central government in Judah in the 10th century is very inconvenient for his views. He [Garfinkel] says with some 96 percent of this site still to be unearthed, a process likely to take 10 years, he hopes that more writing, more olive pits and more pottery will be uncovered, and add depth to what he believes is a revolutionary find. Most critical in the whole discussion is this note of caution. Too often absolute and sensational conclusions are made after the first discoveries. We have time. Any discoveries heralded now, of course, certainly makes recruiting slave labor volunteers much easier. The New York Times does not have any photos of the site, but we do. For more photos of the site in relation to the Elah Valley, and my speculation before the Times article or Garfinkel’s lecture, see this previous blog post. The Times article does not mention the possibility that Khirbet Qeiyafa is Ephes Dammim. One cannot overemphasize the importance of the finds in this level, since it may provide the first concrete, well-dated (from several perspectives) context from the early Iron Age IIA in Philistia. In fact, the finds from this level may serve as a central key to solving the “hot debate” on the chronology of the Iron Age, raging for now for more than a decade. Hopefully, the 14C results will be available by late 2008.
these finds demonstrate conclusively that our original assumption that the city of Gath was very large during the Iron Age IIA, reaching ca. 45-50 hectares [108-120 acres] in size, was correct. This makes it perhaps the largest site in Philistia, and perhaps in the entire Land of Israel during this period. As such, it appears to match the image of Gath that is portrayed in the biblical texts that relate to the early monarchy, in which the city is described as the largest and most important of five cities of the Philistine Pentapolis, the primus inter pares among the five cities. For many reasons, this excavation looks like it will be extremely beneficial for archaeological and biblical studies. Recently Dr. Thomas Levy of the University of California at San Diego was inducted into the National Academy of Sciences. In conjunction with that, he published an article in their journal (abstract here) about his work at Khirbet en-Nahas, including his belief that the copper mines were in operation here during the time that the Bible records King Solomon as mining copper. Lots of new sources and blogs have made a big deal out of the story, and while it is a good story, it is not a new story. If you haven’t read about it before, or if you need a refresher, by all means read it again. But if it all sounds familiar, you know why (NY Times 2006 article here; see also article in a recent issue of Biblical Archaeology Review). A brief report of the finds from the 2008 season at Hazor is now posted (click link at top or directly here). Rather than pumping from the higher-altitude Tel Dan spring, the kibbutz will receive its water from the lower Dan spring, which can supply the kibbutz in a more sustainable manner. "The right of nature to water is protected by law since 2004, but it doesn't mean our work is done - rather, it has just begun. We've [also] managed to increase the amount of water in the Ein Gedi Nature Reserve, and to revive the Ein Gedi Stream after 50 years, and today we are taking an important step forward in increasing the amount of water in the streams which feed the Jordan," he said. 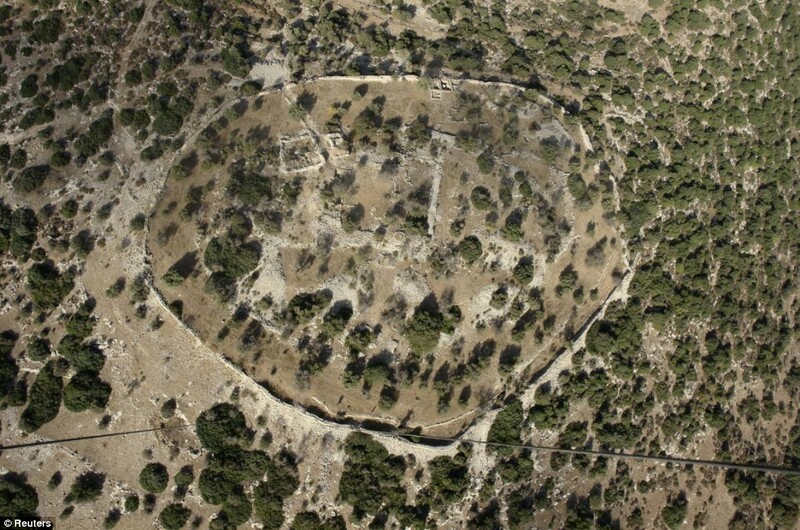 If I were teaching a course in historical geography now to advanced students, I'd cancel one of the assignments and have them write a paper on the site identification of Khirbet Qeiyafa. They would be required to use all of the available data in suggesting possible candidates. Since I'm not teaching such a class, I can post my own thoughts here without fear of hindering their research. It’s been a few weeks since I wrote about Kh. Qeiyafa, so a brief review is in order: Located next to the Elah Valley where David fought Goliath, Kh. Qeiyafa has been excavated the last two seasons (2007-08). This summer a 10th century B.C. inscription (ostracon) was discovered (photo), the contents of which have not yet been revealed, but may be very interesting. The place to start in identifying Kh. Qeiyafa with a known historical place name is to look at the general area of the site. Kh. Qeiyafa is located on the north side of the Elah Valley, roughly north of probable Socoh (Kh. Abbad/Kh. es-Suweikeh) and east of probable Azekah (Tell Zakariyeh). Those last two identifications are generally agreed upon by scholars, but as far as I know there's no certain proof of either identification (for a good discussion of Socoh and Azekah, see The Sacred Bridge, page 147). That's important to keep in mind as we proceed under the assumption that Abbad = Socoh and Zakariyeh = Azekah. Early explorers who identified sites like Hazor, Beth Shemesh, and Beth Shean did not have the advantage of aerial photographs and Google Earth. But since we have those at our disposal, we will put them to use. You can locate Qeiyafa on Google Earth using this kmz file. You can see the site in relation to Socoh (Abbad) and the Elah Valley on the photo below. 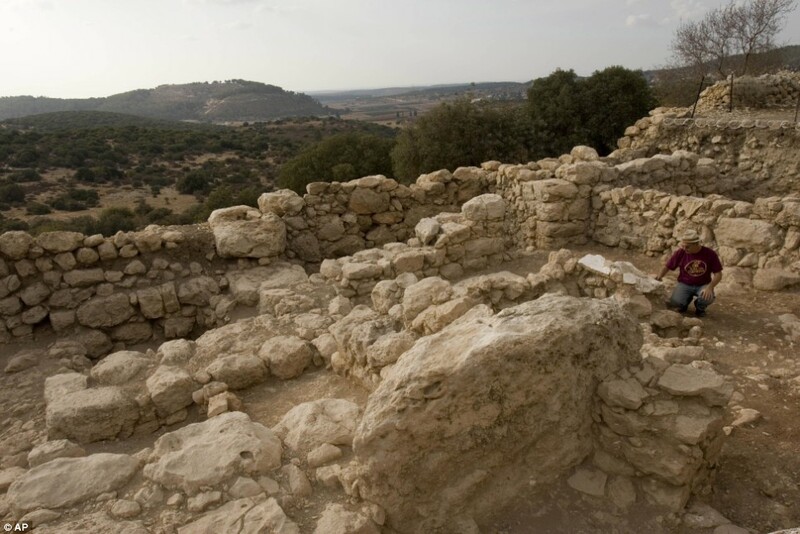 Archaeology is critical in determining site identification, and Qeiyafa has remains dating to the early 10th century and to the Hellenistic period. To do a thorough job in my little exercise, one would need to investigate Hellenistic sources concerning sites given in this area. Because the occupation gap is so large (c. 800 years), it is possible that the Iron Age name was not preserved. Since I am less knowledgeable about Hellenistic sources, and don't have the necessary time, I am going to ignore this part of the equation. The textual sources that we have for this time period are limited. The Bible is the obvious place to start, though as I'll note, some scholars question the traditional dates given to biblical texts. 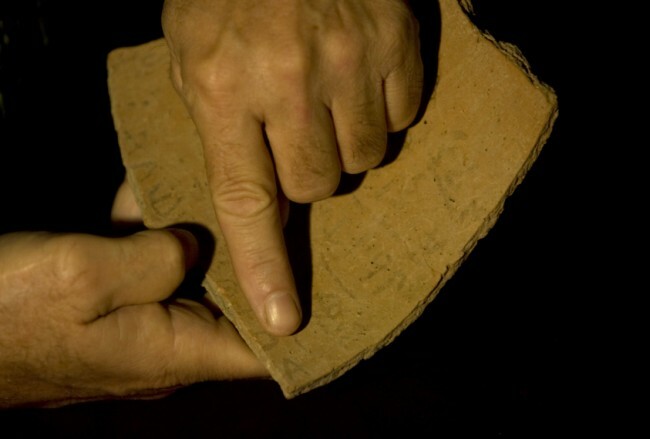 Another source is the ostracon previously discussed. It is possible that this ostracon has one or more place names and may single-handedly answer this question. (Well, not really single-handedly, as it has to be in agreement with the rest of the data, but its relative importance is potentially great.) Another possible source is Shishak's conquest list as given on the Bubastite Portal in the Karnak Temple. Since no other sites in the vicinity of the Elah Valley appear to be mentioned by Shishak, I am going to ignore that for now. What can we learn from the Bible? It might be instructive to note first that many scholars these days would sneer at this question. It then would be worth reviewing just how many hundreds of accurate site identifications were made in the last 150 years, using the Bible as the primary source. That is how Edward Robinson did it, as well as many successors on down to Yohanan Aharoni and his students and "grandstudents" (among whom I count myself). Now the Philistines gathered their armies for battle. And they were gathered at Socoh, which belongs to Judah, and encamped between Socoh and Azekah, in Ephes-dammim (ESV). While the locations of Socoh and Azekah are generally agreed upon (see above), the location of Ephes-dammim is uncertain. Based on the above text, it seems that it is located “between” the two sites. “Pas Dammim” is mentioned in 1 Chronicles 11:13 and could well be the same place, though the event described there is a different one than the David and Goliath story. A parallel to 1 Chron 11:13 is given in 2 Samuel 23:9; the place name is lacking in the Masoretic Text but is given as "Pas Dammim" in the Septuagint. These are the only references to Ephes/Pas Dammim in the Bible. In teaching the David and Goliath story, I’ve pointed to the “gas station” (labeled on the first photo above) as a possible place for Ephes-dammim. There's no evidence for this, but since no other site has been identified and this sits neatly between Azekah and Socoh on the southern ridge of the valley, it was a convenient marker. Some have suggested that the modern site of Damun preserves the name of Ephes-dammim, but as Steven Ortiz notes in the Eerdman's Dictionary of the Bible (p. 411), Damum is 4 miles (6.5 km) northeast of Socoh when one would expect it to be west (and east of Azekah). Another possible text that lists cities from the 10th century (though many scholars think it dates to much later) is the list of Rehoboam's fortifications (2 Chronicles 11:5-10): “Rehoboam lived in Jerusalem and built up towns for defense in Judah: Bethlehem, Etam, Tekoa, Beth Zur, Soco, Adullam, Gath, Mareshah, Ziph, Adoraim, Lachish, Azekah, Zorah, Aijalon and Hebron.” The location of nearly all of these sites is pretty well agreed on, not suggesting another possibility for Qeiyafa. A text that many scholars would go to for sites is the city list of Judah from Joshua 15. Clearly this is the best geographical list for the area, but I didn't start there because I believe (hold your breath) that this list dates hundreds of years earlier than the 10th century. Most scholars do not, and accordingly, I will not ignore it. Joshua 15:33-36 lists cities of Judah: “In the western foothills: Eshtaol, Zorah, Ashnah, Zanoah, En Gannim, Tappuah, Enam, Jarmuth, Adullam, Socoh, Azekah, Shaaraim, Adithaim and Gederah (or Gederothaim)﻿—fourteen towns and their villages.” The location of many of these cities is not positively identified. Based on the sites whose identification is generally agreed on (Eshtaol, Zorah, Jarmuth, Adullam, Socoh, Azekah), the list seems to proceed from north to south. The Elah Valley sites are all known (Adullam, Socoh, Azekah), and do not give us an extra name to associate with Qeiyafa, particularly between Socoh and Azekah as we might expect from 1 Sam 17:1. If Joshua 15 is a pre-10th century text, then this is not surprising. The “prophet of the Shephelah” is Micah, who lived in the late 8th century. His hometown is given as Moresheth (probably known elsewhere as Moresheth-gath) in Micah 1:1. He pronounces judgment on many cities in the Shephelah from 1:10-16, a number of which are unknown (particularly in vv. 11-12). Too little is stated to pin down locations for these (Beth Ophrah, Shaphir, Zaanan, Beth Ezel, Maroth), but none is mentioned in connection with Adullam, a city on the eastern end of the Elah valley. Again, I wouldn’t expect to find a relevant name here since Qeiyafa was apparently abandoned several hundred years earlier. Are there other possibilities? A quick check of Ahituv’s Canaanite Toponyms in Ancient Egyptian Documents, Tabula Imperii Romani, and Eusebius’s Onomasticon do not seem to suggest any other potential site names. Was Kh. Qeiyafa a Philistine outpost? This summer the excavations discovered a four-chambered city gate and a 13-foot-wide (4 m) casemate wall. (Photos of excavations here and a 4-minute video of mostly still photos here.) It certainly was a stronghold, and the only two known powers of the region at this time were the Philistines and the Israelites. The Egyptians were back home enjoying their Third Intermediate Period, and there does not seem to be any strong contingent of Canaanites in the Shephelah (those would have likely migrated to where there were fewer enemies, such as the Jezreel Valley). We can speculate further. Perhaps Kh. Qeiyafa was Ephes-dammim, and it was constructed by the Israelites in the 11th century as they competed with Philistia for the Shephelah. But one day the Philistines succeeded in capturing the fortress. That brought Saul and the Israelites down to battle to regain their stronghold. That could explain the otherwise curious reference in 1 Sam 17:1 to Ephes-dammim, as well as to giving its specific coordinates (since it was not well-known, then or later). Unfortunately for the Israelites, Goliath wanted to make the battle a contest of champions and there was no one brave enough among the Israelites to respond. The Israelites were encamped opposite the Philistines on the south side of the valley (which is the opposite of how I have always pictured it), or possibly in the hill country to the east. David’s victory sent the Philistines fleeing towards Gath and Ekron (1 Sam 17:52), which makes perfect sense given the location of Kh. Qeiyafa. While the above paragraph is speculative, the data that connects Qeiyafa with Ephes-dammim seems to me to be stronger than that which exists for many biblical sites. The biblical text is very specific, and Qeiyafa matches exactly. The dating of the fortress to the early 10th century is very close as well. It’s certainly intriguing to consider. Perhaps the ostracon discovered this summer will help to relate Kh. Qeiyafa to the biblical narrative, or even to confirm/deny the possibility that the site is biblical Ephes-dammim. We’ll be interested to learn more when details are released. For centuries Jews have remembered and mourned the destruction of the Temple through traditions such as crushing a glass at weddings or leaving unpainted a patch of wall opposite the entrance to one's home - each stressing that nothing can be perfect or complete without the Temple. Talmud scholar Rabbi Yohanan wrote: "During these times that the Temple is demolished, a person is not allowed to fill his mouth with laughter. This is because the verse [Psalms 126] says, 'Then our mouths will be filled with laughter,' and does not say 'Now our mouths will be filled with laughter.' And when is 'then'? 'Then' will be when the Third Temple is rebuilt." In other words, "Jewish life without the Temple is like fish out of water," says Rabbi Chaim Richman, head of the international department of the Temple Institute. An author of 10 books on the Temple, Richman adds: "Do you realize that 202 commandments out of 613 must have the Temple to be fulfilled? Without the Temple, Judaism is a skeleton of what it's supposed to be." Arutz-7 published several articles related to the Sukkot (Tabernacles) celebration in Israel, including a photo essay of Sukkot, an article and video on the priestly blessing, and an article and video of the public reading of the Torah that occurs every 7 years. Eisenbrauns has a remarkable deal going until October 31: anyone can get any of their conference (SBL/ASOR) specials at conference prices! Not only does that save you a flight to Boston and conference fees, but if you’re going to Boston, it saves you from carrying an extra suitcase (which now results in a surcharge). There is some fine print, but it’s all very reasonable. The page probably of most interest to readers of this blog is the Carta page (this is the direct link in my browser, but no guarantees that it’ll work for you). Another work that may be significant in the present archaeological controversy over the 10th century is Literate Culture and Tenth-Century Canaan: The Tel Zayit Abecedary in Context, edited by Ron E. Tappy and P. Kyle McCarter Jr. That was just released on Thursday, includes a free DVD, and is available for only $26. The Jerusalem Mosaic reports that a new park will be constructed at the Beit Zayit Reservoir. Many visitors to Jerusalem drive right by this (on the south side of Highway 1 before the last ascent to Jerusalem), but soon will have reason to stop for a picnic or a boat ride. In addition, a 35-mile (60-km) bike trail is being built to connect a series of parks in the Jerusalem area. Publicized earlier this summer, but not noted here, is a fragment of Nehemiah from the Dead Sea Scrolls. Though small, this is the only known portion of this book from Qumran. You can see the fragment and read about it here. Several years ago one of my favorite websites to frequent was Bible and Interpretation. I appreciated the news updates as well as the articles, which came from a variety of perspectives. For lack of funding, the site went dark. Today the site is back with a new design and the promise of regular updates and essays. I’m delighted to see its return and am sure that it will be worth checking in on. If you find it valuable over time, consider sending a contribution. After putting their heads together, the Jerusalem Development Authority, the municipal Tourism Authority, the Tourism Ministry and the municipal company Ariel came up with a brilliant move called Autumn Nights in the Old City. Successful beyond their wildest dreams, it consists of special (free) Monday and Thursday programs offered from the beginning of September until the end of October. Among the goodies are two light-hearted guided tours, evening performances of vastly diverse music programs and discounted museums kept open until evening. The article has lots of details of the sites that are open and the costs. If you like to take photographs, I’d recommend the Ramparts Walk and the Tower of David. If you need more reasons for why you should visit Israel, or if you just want to enjoy seeing the land again, take a look at the recently posted “Journey to Israel” video on the blog of Wayne Stiles. The precise location of the find is not being released, for security reasons. The sarcophagus cover fragment - 60 centimeters (2 feet) long by 48 centimeters (19 inches) wide - is made of hard limestone, is meticulously fashioned, and bears a carved inscription in Hebrew letters that are both similar to today's script and typical of the Second Temple period. Other discoveries at the site include public and residential buildings, agricultural installations, pools and cisterns. Tombs from the 1st centuries B.C. and A.D. are very common in Jerusalem. There was a large upper class that built lavish stone tombs, approximately 1,000 of which have been found. The full story (and a tiny photo) is here. UPDATE (10/8): Haaretz has the story with some new details, and the Jerusalem Post has a 2-minute video about the excavation and discovery. The water level in Lake Kinneret dropped two meters this year, the Water Authority said Thursday, a steeper annual drop than in any previous year. The hydrological year ended on September 30 with the Kinneret at 214.05 meters below sea level, down from its height of 212.05 meters below sea level reached on April 3. The Kinneret's "black line," newly coined this year, is 214.87 meters below sea level. When the black line is reached, the pumps in the lake are exposed to the air, and they can no longer send water into the National Water Carrier. In July, the lake dropped below the "red line," at which the concentration of pollutants rises to undesirable levels. Since spring 2004 the Kinneret has lost 5.13 meters, which is equivalent to 850 million cubic meters of water, the authority said. That is roughly equivalent to an entire year's worth of household water use. This was the fourth consecutive year of dwindling rainfall and the forecast for the next couple of years is just as bleak.